Susan Boyle said she hoped to perform her signature song, "I Dreamed a Dream." 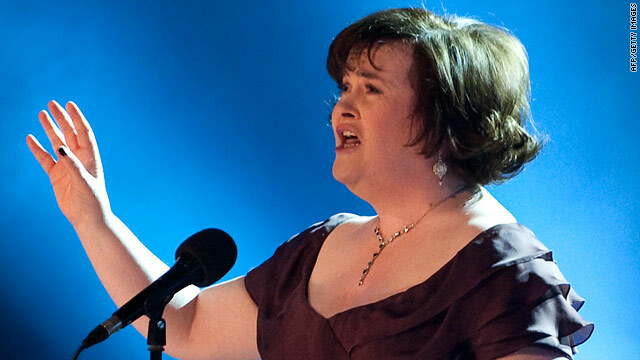 NEW: Boyle plans to sing her signature tune, "I Dreamed a Dream"
London, England (CNN) -- TV talent show star Susan Boyle will sing for Pope Benedict XVI during his visit to Scotland next month, the Catholic Church in Scotland said Wednesday. A church spokesman said in June they were negotiating with the singing phenomenon to perform. Benedict is due to visit England and Scotland from September 16-19. Boyle will perform three times at Bellahouston Park in Glasgow on Thursday, Sept. 16, the Scottish Catholic Media Office said. She will also sing with the 800-strong choir at the open-air Mass there. In the pre-Mass program, Boyle plans to sing the hymn "How Great Thou Art" as well as her signature song, "I Dreamed a Dream," the tune from the musical "Les Miserables" that shot her to fame in April 2009. To be able to sing for the pope is a great honor and something I've always dreamed of -- it's indescribable. "To be able to sing for the pope is a great honor and something I've always dreamed of -- it's indescribable," Boyle, a Catholic, said in a statement. "I think the 16th of September will stand out in my memory as something I've always wanted to do. I've always wanted to sing for His Holiness and I can't really put into words my happiness that this wish has come true at last." Boyle said her late mother was at the same Glasgow park when Pope John Paul II visited in 1982. After the final hymn at the end of the Mass, Boyle will sing a farewell song to the pope as he leaves to go to the airport for his flight to London, the church said. The pope's visit will be the first state visit to the United Kingdom by a pontiff, according to the British Foreign Office. John Paul's trip in 1982 was officially a pastoral visit, while Benedict's is considered a papal visit. Highlights of Benedict's trip include a visit with Queen Elizabeth II at the Palace of Holyroodhouse in Edinburgh, Scotland, a major speech at Parliament in London, and a Mass in Coventry, England, to beatify the 19th-century theologian and educationalist Cardinal John Henry Newman. Boyle wowed audiences and judges on the TV show "Britain's Got Talent" last year when she unexpectedly belted out the "Les Miserables" classic. The jaw-dropping performance earned her a string of global TV appearances, legions of fans, and a record deal. Though she was runner-up in the show's final, her debut album, "I Dreamed a Dream," was a blockbuster, becoming the most pre-ordered CD in history on Amazon.com.